I’ve spent considerable time working with job seekers and new business owners. Most of them get the heebie jeebies from tooting their own horn, ringing their own bell. Who will do it if you won’t? DO NOT WAIT FOR THE GOOD CHARITY OF OTHERS, too much is at stake. 1. Articulate your strengths – Don’t say “anyone could do that,” because if anyone could, everyone would. What do you do well? How do you do it? Figure out your core business strength. Learn to articulate it well to those who inquire, and sometimes those who don’t, but should know what you have to offer. Write it, wordsmith it, practice it. It’s your verbal business card. 2. Jealously guard your time – As I’ve said before, if you don’t spend your time delivering your own package, someone else will use your time to to deliver their package. Your business is important. Your time is currency for your business. Do more than claim it, jealously guard it! 3. Calendar time to do research that will help your business grow – Looking for calls for artists? Researching galleries to partner with? Allow time on a regular basis to research growth prospects. Put it in your calendar. Also calendar time to follow through and follow up. Create opportunity. 4. Document your accomplishments – I once worked with a VP whose jaw dropped when I entered his office with a list of all the value I’d added to the company through my own efforts the previous year. People can forget what you bring to the table. Gently remind them. Yes, I did this right before performance evaluations were due. It helped my boss remember my contributions, helped me keep my resume current and gave a bump to my annual bonus. Keep a list and update it regularly. 5. Be organized or hire someone to do it for you – Things slip through the cracks. Don’t let opportunities slip away because they got lost in a paper pile or weren’t properly calendared. The more organized you are, the better you can keep your eye on multiple balls in the air. Not your strong suit? Enlist someone else to help you. 6. Make good connections – There are many opportunities to meet new people and make beneficial connections. Get out, tell people what you do (remember #1? ), ask how you can help them. Don’t work solely through social media…meet people in person, too. Stay current with your contacts and be sure to ask if you need a hand. I love to help people and find in turn, they are happy to assist when I need a hand. It’s a RELATIONSHIP! 7. Charge what you’re truly worth – It’s easy to devalue yourself, and so many people do it. When you first start your business you want the work. What message does it giving it away send? Charge what you’re truly worth. Research your competitions pricing. Don’t be the low price leader…you’ll set yourself up for failure, and it just doesn’t feel good. Check yourself, you want prices to be fair, but that means fair to the client and fair to you! You’re happy to tell other people how great your partner, friend, brother or sister is at (fill in the blank). Extend that same value and courtesy to yourself. 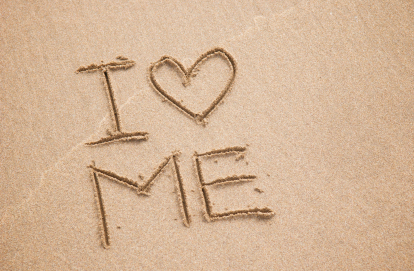 The most successful people advocate for themselves and others…no difference. Don’t wait for opportunity. 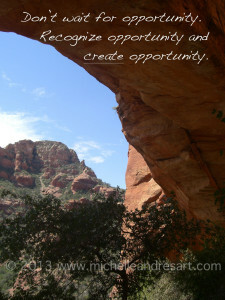 Recognize opportunity and create opportunity! Go Forth and Rock It! I’ve just re-worked my art website – you can take a Peek here! 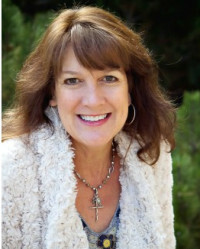 Michelle Andres is a writer and artist. 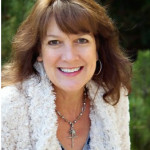 She writes this blog to share tips or a well-lived life and a finely run art business…just for you! You’re right. It’s really hard to talk about myself and my art to other people. I’m working on it. Great article! Thank you, Michelle, for another well-thought-out article! I’m learning to speak more confidently about my acrylic mixed-media paintings to others who ask about my work. I want to share with them my passion for doing art, as well as give them information about where I am showing my paintings. Artists certainly have much to do, including keeping up the energy to do it all! Being a successful artist is a lot of work. But, doing what you’re passionate about helps pump up the energy level. Good for you, Jill! Tell your story! Thanks for the reminder Michele. Very good advice. Big Show of my paintings coming up October 11th-12th and 13th at Bath Artists Studios. So everyone welcome to come and see how good it is. Good luck with the show, Brian. Good opportunity for you to practice #1, #6 and #7. I wish you great success! Great article! I’m learning to toot my own horn, it’s nice to see all these other suggestions to mark off my list as well. Jaime, toot that horn, girl! You are going to make BEAUTIFUL music…and make some music beautiful, too. All green lights to you! Next PostNext You Can Quote Me!